Okay, I think I've spoken enough about how the dream merchants out there play up "ancient rivers of gold" to feather their own nests with your money. Now I want to talk to you about the three main aspects of gold-bearing Tertiary Channels you need to know. I had to smile a bit when my Idaho mining buddy Gary described Tertiary river channels "as dried up old riverbeds." This they are for the most part, but Tertiaries are millions of years old and they carried placer gold at a time when gold mining was only a glimmer in the Creator's eye. Gary also asked about what sort of gold values Tertiaries carry. This is a great question that can be answered pretty simply. 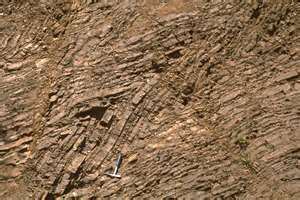 Depending on where they are and the distinct characteristics of how ancient deposition took place, Tertiary Channels can run the gamut as far as their gold-bearing potential is concerned. Some of the richest Tertiaries in the entire world were found in the northern end of California's Motherlode Region, particularly around Nevada City and points north. 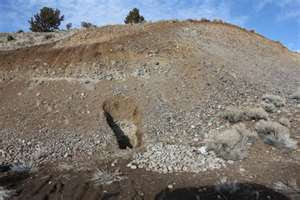 Hundreds of thousands (if not millions) of troy ounces of placer gold were recovered from these ancient riverbeds (often called the Great Blue Lead), including many large nuggets as well as smaller nuggets, coarse pieces, large and small flakes, and the usual fine gold. However, before you begin salivating at the prospect of all that gold you need to understand that this "richness" was relative...some sections of California's Tertiaries carried little placer gold while other sections carried only fine or flour gold. In other words, Tertiary paystreaks could be just as fickle as those in many modern day auriferous streams. I think this is one of the basic misconceptions many small-scale placer miners have about Tertiary Channels...that is, that any and all Tertiaries are money in the bank just waiting to be withdrawn. It's not that easy my friends, sad to say. Here's the plus side though. If you were to locate a good gold-bearing Tertiary section somewhere and had the means and gear to work it, then brothers and sisters you would be working true "virgin ground," something that's nearly extinct these days, particularly here in the U.S. But you're not home free yet. In my next post I'll be talking about the difficulties and the dangers involved in working Tertiary Channels. You didn't really think it was going to be that easy did you? Take care until next time. If you liked this post, you may want to read: "Basic Characteristics of Canadian Placers and Placer Gold"
We pass by formerly hydralicked tertiary channel quite often. It looks like the mountain side has been melted away. Some of those locations have been turned into State Parks. We appreciate history like any other. Open up these parks to panning and sluicing, charge $10.00 and the State Revenue will start growing. Open them up to dredging and the revenue will grow exponentially. Too many bureacratic arms though. One never knows what's good for the other. You're make some fine points here. However, those Tertiaries that were hydraulicked by the old timers have little (if any) gold potential left...a good example would be the Malakoff Diggings (State or Historic Park). But you are absolutely correct about the bureaucrats...they and the special interest groups have ruined California. (Along with the state's inept politicians...)Thanks for the comments. J.R.
You're welcome Keith. Thanks for commenting. J.R.
Guys, any ground gets worked out (or nearly so) eventually. Just by sight alone you should be able to tell that Malakoff is "played out." That's not good gold ground...you'll have to trust me on that. Now if you found ground that hadn't already been hydraulicked, then you're off and running. Or, alternately....if you were good at nugget hunting, any old hydraulic tailings are likely spots. Sorry, but I wouldn't waste a moment of my time at a spot like Malakoff when other very good gold ground is near there...best! J.R.